Osteoarticular infection in children often poses a diagnostic challenge, so much greater as the younger is the patient. 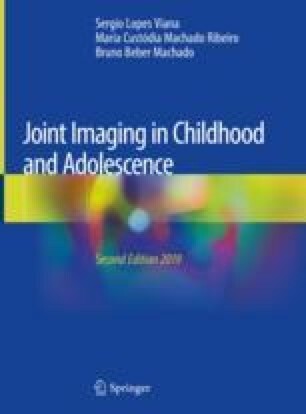 Although joint aspiration remains indispensable for definitive diagnosis of septic arthritis (as well as tissue biopsy and/or culture data for tuberculous arthritis), imaging is a valuable tool in the workup of these patients. No matter the etiologic agent, early and accurate definition of the infectious origin of the arthritis is paramount in order to minimize structural damage and avoid complications and long-term sequelae. This chapter addresses the articular component of peripheral musculoskeletal infections, namely, pyogenic and tuberculous arthritis, together with the imaging features of transient synovitis of the hip, one of the most important differential diagnoses to consider in daily practice. Spinal infection is part of the subject matter of Chap. 12. Bomanji JB, Gupta N, Gulati P, Das CJ. Imaging in tuberculosis. Cold Spring Harb Perspect Med. 2015; https://doi.org/10.1101/cshperspect.a017814. Dubois-Ferrière V, Belaieff W, Lascombes P, de Coulon G, Ceroni D. Transient synovitis of the hip: which investigations are truly useful ? Swiss Med Wkly. 2015; https://doi.org/10.4414/smw.2015.14176. Leonard MK, Blumberg HM. Musculoskeletal Tuberculosis. Microbiol Spectr. 2017; https://doi.org/10.1128/microbiolspec.TNMI7-0046-2017.